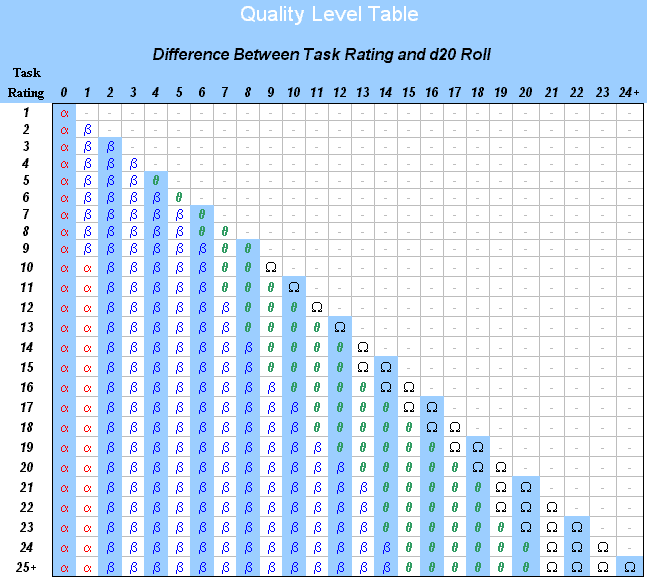 The core idea of the Omega System is very simple: Anything a character attempts is assigned a Task Rating, and the player rolls 1d20, aiming for as low a roll as possible. A roll above the TR is a failure, a roll under the TR succeeds. Should more detail be required, the Quality Level Table is consulted. Cross-reference the TR with the difference between the roll and the TR (subtract roll from TR). This shows the Quality Level of the success. Alpha results represent a bare-minimum success; succeeding by the skin of the teeth. Beta results are a solid success, but without extra effects on the situation. Theta results show a good success, with possible bonus effects that may not have been foreseen. Omega results mean an outstanding success, with extra bonus effects on the situation.